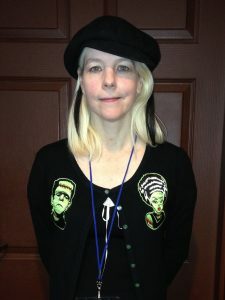 Genre-short filmmaker Devi Snively (best known for her multi-award-winning DEATH IN CHARGE) last ventured into the feature realm with the 2012 release TRIPPIN’, and she’s on the verge of taking her second trip with BRIDE OF FRANKIE, a homage to the Universal monster classics with updated attitudes. Snively gave RUE MORGUE an exclusive chat about the project. The writer/director’s BRIDE OF FRANKIE feature screenplay is based on her same-titled short that’s in the midst of a successful fest tour (including the Buffalo Dreams Fantastic Film Festival, where this interview took place). In the short, Frankie (Rachel Sledd), assistant to the absent Dr. Stein, has created a “bride” named Shelley (Jessica Ridenour) for a male “monster” called Monty (Mark Lancaster). But Monty’s attempts to romance his new mate are clumsy, and Shelley begins to warm toward Frankie instead. Shot in black and white by Claire Bruce, BRIDE (whose official website can be found here) is both a loving homage and a sympathetically revisionist update of the tropes of Mary Shelley and James Whale’s FRANKENSTEINs with a female-centric point of view. Now, Snively is looking forward to expanding on its themes with the long-form version she has written. Is the feature script for BRIDE OF FRANKIE an expansion of the story told in the short, or is the short the first chapter of the longer version? The short is actually an origin story, and the feature is a sequel. It picks up five months later, on the day Amelia Earhart vanishes. In the short film, we see the two women who come together and are going to live on their own terms. But in the feature, they realize there’s trouble in paradise, because living this unconventional lifestyle with no men in 1937, they’re very isolated from the rest of the world. Frankie is unable to get the support for her scientific work, and she’s very frustrated. Meanwhile, her “creature” and paramour feels bad and worried about the relationship, and things are just not as happy as they were hoping. So they go to the outside world for help, and unfortunately expose their unorthodox relationship, so they become separated. Frankie is sent to a women’s asylum—and 1937 is also the year of the first lobotomies—while Shelley, the creature, is sent to a freakshow. She’s mistaken for a human anomaly, and people don’t recognize who or what she actually is. She has to find her voice, literally and figuratively, within the confines of what is, at the beginning, a debilitating, demoralizing environment. But this is actually where she learns to wave her freak flag with pride, if you will. Some people have compared it a little bit to AMERICAN HORROR STORY; we’ve got both the insane asylum and the freakshow. Do you homage Tod Browning’s FREAKS in the script as well? Absolutely! There is a “gooble gobble” chant [laughs], at least in this draft. FREAKS is one of my all-time favorite movies, and I’ve done a lot of reading about Violet and Daisy Hilton, the conjoined twins in that film. Also, I’m married to an anthropologist, so I’m very interested in human behavior and the diverse ways that we can be successful humans in many different ways. What themes are you carrying over from the short into the feature? Basically, it’s about identity and finding out who you are as an individual, but also what your role is in the greater society. That’s something that has always been fascinating about Frankenstein stories: You’ve got these creatures that are reanimated, and in this case also lab-created; all these parts are being put together to create grown-up human beings. But how do they fit in? They don’t have the same culture that we do growing up, so they have to figure it out for themselves. I think a lot of people feel like that in life: that they don’t fit into one simple, clean niche, and they’re outsiders. So how do you rectify that? The problem, for me, with a lot of Frankenstein stories is that they end too soon. I want to know what happens next. The creatures almost always die at the end, and it’s so sad, and I always wonder, could they adjust? Don’t we all relate more to the Frankenstein creatures than we do to the human beings, running around with their torches, being all angry and mean? So I wanted to play with the idea of what happens when a person gets past her conflicts and her insecurities, and comes into herself as a full creature. Obviously, in today’s sociopolitical climate, issues of identity and oppression are very much in the air. Does your script directly address that, or are those themes under the surface? It’s definitely an important part of this story. There’s a lot of exploration of gender and sexuality. There’s a transgender character in the freakshow, half woman and half man, whom Shelley, now separated from Frankie, has a little love-triangle situation with. She’s trying to figure out how she feels, and which way her romantic inclinations lean. But it’s not so much about answering that as exploring the idea that there are many different ways to be a successful human being and have relationships. Would you call the feature a horror film, or more of a drama using the genre’s archetypes? It is a real, real genre-bender, just like the short; we’ve been playing at sci-fi festivals, horror festivals, LGBT festivals, mainstream festivals. A lot of people are interested in the historical aspects of the feature script as well, because I’ve done a lot of research and it’s an alternate-history story. Amelia Earhart shows up after she has vanished—I have a whole new theory to put out there that, for all we know, could be true. How far along are you in getting the feature off the ground? The script has won a few awards, but I haven’t actively started marketing it. I’ve sent it out to a couple of producers, simply on a consultation basis, to get some feedback, and the response has been very exciting. After reading an earlier draft, a producer told me, “Get the page count down, address a few things.” It was great advice, and I took it, so now we’ve got a 96-page script, which will help with the budget somewhat, because it is fairly elaborate as far as effects and locations go, and the ensemble cast and makeup and so forth. The feedback on the latest draft has suggested that it appeals very much to a niche audience, and has the potential to be marketable, which I’m not usually accused of [laughs], so that was exciting! So come January, I have a strategy that I’m going to put it out in the world and hopefully use the short to get the funding to make the feature. What is the enduring appeal of the classic Universal monsters for you? It’s been fun being at this horror festival and others with BRIDE OF FRANKIE, because I’ve found out how many fans of the original films there still are, in all different age brackets. It’s appropriate that they’re the Universal monster movies, because they are so universal. I believe Mary Shelley probably would be pleased to know that, more often than not, the audience can side with the creatures, and the true monsters are members of society that treat them so poorly. The enduring appeal is just that these films capture the outsider feeling that we all experience in life, and that makes it OK to be different.